One of the most distinguished features of Geneva is its architecture. 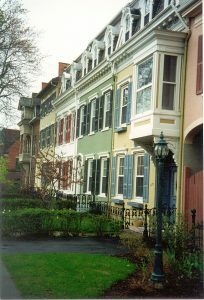 My personal favorites are the row houses around Pulteney Park and along South Main Street. Row houses, otherwise known as Terrace Housing, originated in Europe during the 16th century and can be identified as a row of identical or mirror image house that share side walls. The first row houses in the United States were developed in Philadelphia, Pennsylvania between 1799 and 1820 and were part of the first “speculative” housing developments in the country. Geneva’s row houses were built between 1808 and 1820 in and around Pulteney Park. At the time Pulteney Park served as the village center which included the Geneva Hotel, the post office, the first town hall structure, and the Geneva Academy. Originally the row houses served as shops with living quarters located above. 492 South Main Street, for example, was a store for dress goods and merchandise with stables and barns located in the rear. One of the early row houses built in Pulteney Park by William DeZeng, was 52 Park Place. This was later sold to Jacob Backenstose who was the first tailor in Western New York. 52 Park Place remained in the Backenstose family until 1914. As development of the row houses reached completion in the 1820’s businesses began to move to the waterfront area due to completion of the Cayuga and Seneca Canal and the commerce that it created. These buildings still serve as fine examples of Federal style architecture although many have been updated to include porches and other modern elements of design. Today the row houses serve as apartments, single family homes and even an Airbnb. Many offer stunning views of Seneca Lake along with a convenient proximity to Geneva’s downtown. Your information on row houses in Geneva brought back fond memories. In my view Pulteney Park and along South Main Street should serve as a design cue for new development within or at the city limits. Any such endeavor should also include a focus on any existing maintenance of rehabilitation needs within this city treasure. Because Downtown Geneva was designed to serve a larger population there are perhaps potential locations, a minimum 2 acres needed, that could be built according to the original purpose of the South Main Row Houses, shops with living quarters located above.